When, nearly thirty years ago, Ted Turner started the Cable News Network, critics scoffed. How committed are you to this crazy idea? they asked. What will you do when the novelty wears off? I think I can declare this blog a success, albeit a modest one, unlike Turner’s. I know that I have learned much from those who have shared their ideas publicly or by way of private emails. At times, I have been sorely challenged—and at other times, immensely entertained—by readers’ comments. 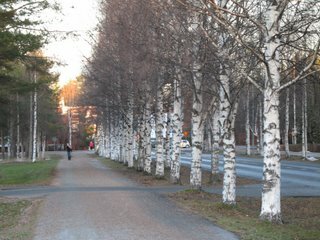 I left the land of glorious birch trees (see photo above) on December 20 and have been home--and reunited with my luggage on Christmas day--ever since. Meanwhile, fulbrighterinfinland has been running on fumes. I will be calling it quits after this post, but the site will remain open for awhile so that readers might conduct any residual business they might have. Naivete is a wondrous thing. When I began this venture last August, I had no idea it would prove to be so demanding a master, so addictive, or so intensely gratifying. I am sorry to see it end, but life goes on. I sincerely thank you for your company and your support.